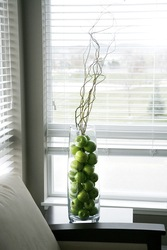 Choosing window treatments for your home is as personal a decision as selecting the furnishings for the rooms. The first step is to weigh the pros and cons of the many choices. In this guide, we will outline the factors regarding two window treatment options: curtains and blinds. Either can add value to a home depending on the quality of the product and the installation, but each one has different advantages and disadvantages. Venetian blinds: are horizontal slats that allow light control. Vertical blinds: have slats made from stiffened fabric, plastic, or wood hanging from a horizontal track. They are usually used over a sliding door or a long window. Roller blinds 1: or shades are fabric panels rolled onto a horizontal pole. Roman shades 2: are also fabric, but they gather horizontally when raised. Below we discuss the different factors to consider when deciding between curtains and blinds. 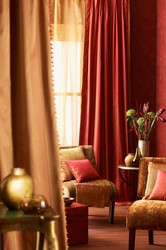 Curtains add style and texture to a room. They can be chosen to coordinate in color with the rest of the furnishings or stand out as a contrasting element. Blinds come in many styles, colors, and textures, but they are not as versatile in design as curtains. Curtains can give a sense of warmth and coziness to a room. The fabric of curtains also acts as a sound buffer to quieten a room. Blinds, on the other hand, make a room seem larger because they are less intrusive, folding out of the way more easily. Some homeowners choose to apply both curtains and blinds for a combination of design variety and functionality. 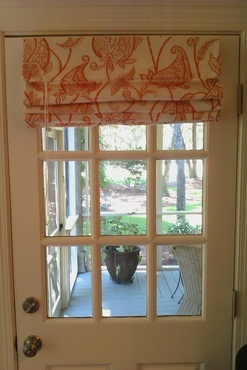 Another option is to install a valance, a length of decorative drapery hung over a window, to add style to the blinds. These are more expensive options, but they may meet all the needs of the home. The cost of curtains or blinds vary widely depending upon the quality, the materials, and whether the window treatments are ready-to-hang or custom fit. Curtains made of cotton or a cotton blend can cost as little as $10. Curtains made of linen or other luxury fabrics can cost $1,000 or more. Blinds vary in cost as well. Plastic or vinyl 3 blinds, without installation, can cost as low as $8, while wooden or high-quality vinyl 3can cost more than $200 without installation costs. The best way to decide is to shop several sources and choose the best features for your budget. Both curtain and blind installation are good candidates for DIY projects for someone with average home improvement skills, maintenance skills, and basic tools. If a professional is hired for the job, the cost to install blinds averages $650 for faux wood slat blinds for eight windows. If you have aluminum blinds installed on your windows, expect to pay $165 to $205 for blinds for 8 windows. The labor will cost anywhere between $160 and $520. 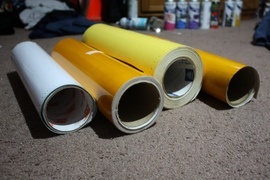 Materials for the project will be about $20 to $25. The total cost to install aluminum blinds for 8 windows ranges from $345 to $750. Installation of curtains for the same number of windows will cost $400 to $600 for DIY, low-cost materials. The cost for professional installation of curtains made with high-end materials, high-quality decorative finials, and automated opening and shutting systems can cost as much as $2,000 to $5,000. When paying to install curtains or blinds, it is best to have the installers take the necessary measurements since they may not guarantee the order will fit if they did not measure the windows themselves. Depending on the opacity, the amount of transparency, of the curtains, they can block incoming light, if desired. Blinds with horizontal or vertical slats are more versatile. They can be adjusted to let in exactly the light desired in a room. You can allow indirect light while still maintaining some privacy. A homeowner desiring curtains may choose more expensive thermal-backed curtains for extreme climates for maximum energy efficiency. These curtains have fabric facing the room and other layers inside and facing the window for blocking heat and cold. You will have to sacrifice natural light with this option, and the curtains should be carefully installed to provide a tight fit to the window frame. Blinds form a natural barrier to heat and cold when closed, but they can still allow filtered light if they are not completely opaque. However, according to Energy.gov, they are more efficient at blocking summer sun than winter cold. They can block direct sunlight while being open slightly to allow indirect light. One energy efficient choice is the cellular blind, which has collapsable air pockets that provide insulation. Make single cords as short as possible. See that cord stops are installed that will limit the movement of the cords. How much does it cost to install curtains or blinds in my city? Cost to install curtains or blinds varies greatly by region (and even by zip code). To get free estimates from local contractors, please indicate yours. 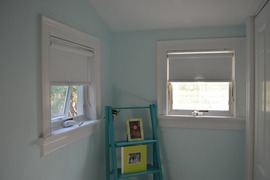 Cost Considerations: Roller shades are the most economical type of blind, running from $20 to $60 for a 27 inch window.